It’s only at this time of the season that a point away at Barnsley – after twice going behind – isn’t viewed as a good result. If we’re serious still about making the play-offs, we need wins, and now, before hope slides away. Having struggled in recent months at home against struggling sides, a home game against a struggling Bristol Rovers – or, judging from the build-up, Jonson Clarke-Harris FC – isn’t exactly a welcome prospect. The biggest talking point from last week’s draw at Barnsley was the dip in form that Dujon Sterling is experiencing, with the first goal largely down to a sliced clearance from the Chelsea youngster. The past few performances have been reminiscent of the shaky Sterling that we saw during the opening month of the season and is perhaps the result of having played so much football in his first full season as a senior player. He may be dropped, he may be given a chance to play himself back into form. With the squad as thin as it is at the moment in terms of players out of the side who would add something different, it’s hard to see Mark Robins being tempted into making any other changes. The result of this game could well dictate Robins’ approach for the remainder of the season, win and he’s likely to stick with this current XI until there is no hope of making the top six, lose (and Saturday’s results go against us) and it could be the beginning of a period of experimentation with the likes of Zain Westbrooke, Jordan Ponticelli, Charlie Wakefield and various regulars of the under-23 side given a chance to make an impression ahead of next season. Returning to Dujon Sterling, our last meeting with Bristol Rovers represented the nadir of his season from which he rallied to become one of our leading performers. Despite a bright start from the Sky Blues at the Memorial Stadium, three lapses in concentration from Sterling directly contributed to Bristol Rovers goals, rendering Dominic Hyam’s goal just before half-time a mere consolation. A strong and committed centre-back in his playing days, Graham Coughlan has payed his dues as a coach and assistant manager before stepping in as the initial caretaker replacement for the popular Darrell Clarke at Bristol Rovers back in December. Coughlan has provided the kick up the backside that was needed after things had gone stale under Clarke’s reign. They appear to be on the way to safety, although a run of four games without a win has come at a bad time. The most notable impact Coughlan has made has been in bringing in a goalscorer in Jonson Clarke-Harris to a side that was badly missing one. The overall level of performance throughout the campaign for Bristol Rovers hasn’t necessarily been that bad, however, the loss of last season’s top-scorer Ellis Harrison over the summer and the failure to adequately replace him has been why a decent squad has struggled for the majority of the campaign. You may or may not have noticed that Jonson Clarke-Harris now plays for Bristol Rovers and is doing rather well. Although there was a level of dismay around his departure in January, it was more around not having a replacement lined up rather than the impact he had been making. With nine goals in his 11 appearances for Rovers thus far, Clarke-Harris is the form goalscorer in the division having looked anything but a reliable hit-man during his 12 months with the Sky Blues. While Clarke-Harris’ form in front of goal demonstrates the vagaries of football, it seems at least partially down to the former Sky Blues academy product being backed by Graham Coughlan – who worked with him at Southend United earlier in his career – to be the main striker at the club, which he never was at Coventry City. His confidence is high, as evidenced by some of the emphatic and ambitious goals that he has scored in a Bristol Rovers shirt. The introduction of a goalscorer to the mix has started to make the rest of Bristol Rovers’ squad look better than it had been for much of the season. 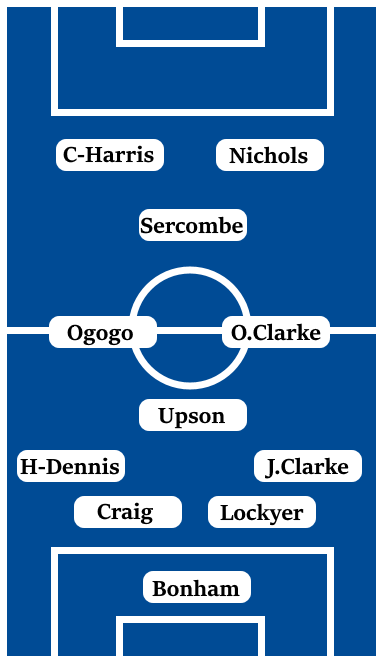 The non-goalscoring forward Tom Nichols’ work around the penalty area in creating openings is being cast in a better light, as have the talents of deep-lying playmaker Ed Upson, club talisman Chris Lines, the energetic Ollie Clarke, and the attack-minded Liam Sercombe in central midfield. In central defence, Bristol Rovers have a Wales international in club captain Tom Lockyer, while in goal, Jack Bonham’s shot-stopping had been carrying the team through a difficult first half of the campaign. In a recent 4-1 defeat against Doncaster Rovers, Bristol Rovers lack of width was brutally exposed. With just one natural winger in the squad in Alex Rodman, Graham Coughlan has largely varied between a 4-3-3 with strikers operating out wide and a diamond formation, taking wingers out of the equation entirely. The overlapping runs of Brandon Mason and Dujon Sterling (if he starts) at full-back could the key to our attacking play, as well as Liam Kelly’s ability to switch the play quickly from the base of midfield. This is going to be the kind of test of composure and patience at home to a determined opponent that this side has largely failed in recent months. As motivated and energetic as Bristol Rovers are likely to be, we not only need to be able to match that but to approach this game with a cool head as we look to pick holes in an opponent rather than try and force things.